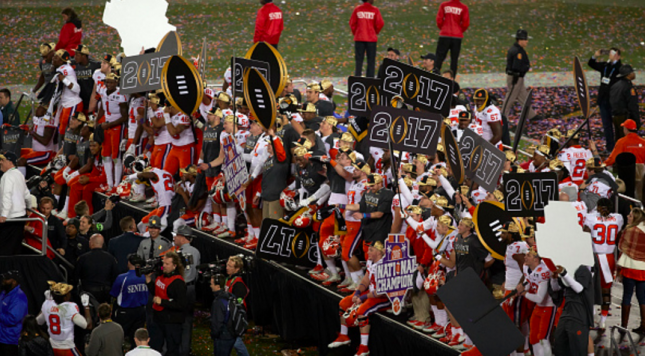 It has now been a week since the bowl games have ended, which means it is time for college football fans everywhere (except in Clemson, South Carolina) to start to put the season to bed and finish recapping it. While everyone looks back at the season, I prefer to look back at how each team finished it. Therefore, similar to last year, I will be grading every team on their performance during bowl season. For some teams, bowl season doesn’t accurately represent what the team achieved during the year. But it is always the last memory we have of a team, and therefore it is what we will carry into the next season. Remember, all of these grades are subjective. Sometimes I will look at a team just based on the performance in the bowl game, and sometimes I will base it on how well the team should have played. This is more of an art than science, so by all means feel free to disagree with me. Air Force: The Falcons got out to a slow start and it looked for a while like the Jaguars were on their way to their second upset of a Mountain West team this year. Air Force turned on the jets in the second quarter, though, and the game turned out to be quite the blowout. South Alabama: The Jaguars were clearly outclassed in this game, which we all basically knew coming into the game. The fact that they played well for the first half and that the offense did a bit of damage is a good thing, even if things got away from South Alabama at the end. Georgia: The Bulldogs were not great in this game. Georgia went three-and-out four times in the first half, turned the ball over once, and missed a field goal. TCU was no better, though. All-in-all, this was an important win for the Georgia program and young quarterback Jacob Eason, even if the game itself was poor. TCU: Even after a terrible season, TCU still had a chance to cap it off with a bowl win. Three turnovers and two missed field goals will cost any team just about any game, though. The offense looked decent at times, and the defense was much better than at any time during the season, but this game was still ugly overall. Tennessee: The Volunteers are coming into the offseason with a big win over a Big Ten team again. It didn’t work out so well last year, with coach Butch Jones on a serious hot seat. The team played well in this game, even if giving up 24 points to a Nebraska team without Tommy Armstrong and Jordan Westerkamp seems high. Nebraska: It’s a little hard and unfair to judge Nebraska when the Cornhusker team was missing too many key components in the bowl game. The backups looked solid, though, but the offense will need a ton of rebuilding this offseason. Stanford: The Cardinal dominated most of this game in the trenches, but the offense’s inability to do anything almost cost Stanford a win here. David Shaw will need to revamp his offense before next season. North Carolina: The Tar Heels played a good game — and Mitch Trubisky showed why some have him as a top two draft pick — but three turnovers, including a pick-six, did them in. It was an entertaining game and North Carolina showed that they belong as a team in or near the Top 25. Florida State: What a game! Really, all I can say is wow. Dalvin Cook actually was held in check for most of the game, but a 71-yard touchdown run will really boost those stats. The defense held Michigan to a very low output all game. One of the bigger miracles of this game is how many points Michigan managed to put up, honestly. All in all, this was a tremendous performance from the Seminoles. Michigan: The Wolverines ended the season losing three out of four games — and it all boils down to just awful offensive performance for essentially the entire second half of the season. That continued into the bowl. The defense couldn’t do much to really stop Florida State, which makes the fact that Michigan almost won this game very impressive in its own right. Georgia Tech: The Yellow Jackets very quietly had a great season. Justin Thomas never managed to replicate the magic from his sophomore season, but he got the team to nine wins again while perfectly running the triple-option. The defense was also much better this year, and in this bowl game, than last season. Paul Johnson is still a great coach, for anyone who had doubts after 2015. Kentucky: The Wildcats played a decent-enough game on defense against the triple option, and the offense did a fine job moving the ball. Kentucky wasn’t able to finish drives, though, which was really the difference in this game. LSU: Like everyone since November started, the LSU defensive line ate Louisville and Lamar Jackson alive. LSU needs a quarterback next year if the Tigers want to challenge Alabama, but this team is built very well and capped off a solid season with a strong bowl win. Louisville: I can’t even critique Lamar Jackson. He played without an offensive line and got blasted over and over again. He got sacked eight times and only completed ten passes. It’s hard to blame him, but the team really couldn’t do much when he started getting hurried and sacked too much. That’s on the O-line, which November and December taught us really was the heart of the team. Alabama: The Tide skated by this game on the defense, because this really was the first time all season that the offense was stopped cold. Jalen Hurts looked like a freshman, but the defense pressured Browning enough to make mistakes — and just straight-up didn’t let Washington score enough points to be in the game. Washington: The Huskies couldn’t do much on offense, and a bad pick-six really meant they didn’t have a chance. Chris Petersen has this team heading towards the college football elite, but he needs bigger players in the trenches if he’s going to start beating Alabama. Clemson: The Tigers were clearly prepared for this game. The offense did pretty well against the Ohio State defense, though two Deshaun Watson interceptions could have made a big difference in a closer game. Even including that, though, Clemson played this game as close as possible to perfection. Ohio State: I could go on for a long time about how awful Ohio State was in this game, but I’ll try to contain it to this: Ohio State showed no innovation whatsoever in offensive play calling or game plan. Clemson knew every play that was coming and beat Ohio State to the punch on defense for all 60 minutes. It’s a good thing that Ohio State has a new offensive coordinator for 2017. Clemson isn’t 31 points better than this Buckeyes team if Ohio State is playing smart offense. The Buckeyes just didn’t in this game. Florida: The Gators– finally –showed some life on offense. The offensive line consistently got a strong push up front and Austin Appleby did an impressive job throwing the ball, especially in the second half. Florida’s defense was dominant as always, though Iowa did a much better job moving the ball before C.J. Beathard hurt his hamstring. Iowa: The Hawkeyes couldn’t do anything on offense and the defense missed a lot of tackles. There’s not much more to say about this game. Iowa just plain got beat. Wisconsin: As much as it never felt like Wisconsin was in any danger during this game, it also never felt like the game was out of hand. The Badgers consistently got stops and the offense consistently moved the ball; still, Wisconsin was only able to put up 24 points. As solid as Wisconsin was in this game, the Badgers were never able to put the game away. That cost them a win in the Big Ten Championship Game and it almost cost them here. Western Michigan: The Broncos were outmatched in this game but never gave up. Coach P.J. Fleck did a great preparing his team, and his leadership was evident when the Broncos responded so well after being dominated early. A win would have done amazing things for the Western Michigan program and the entire MAC, but the Broncos represented their school and conference well. There was no shame in this game. USC: This game was, by far, the best of bowl season. USC’s early offensive success stalled in the third quarter, when Penn State’s adjustments clearly had an effect and the Nittany Lions capitalized on USC’s mistakes. When Penn State’s defense got tired late, though, the USC offense was able to take full advantage. USC didn’t make many mistakes, though the defense will need some work coming into 2017. Penn State: The Nittany Lions started slow, but Trace McSorley and the offense are dangerous against any team. Penn State didn’t give up when it got down early, but the play calling got too conservative in the fourth quarter until the game was tied. Three interceptions by McSorley — especially the third — turned out to be the difference. Penn State can go into the offseason knowing it played a great season and just barely lost one of the best Rose Bowls ever played. Oklahoma: Due to extreme parity in the SEC and bowl contracts, the Sooners were gifted with an outmatched opponent in one of the biggest bowl games of the year. Baker Mayfield and the offense did their thing against an SEC defense and ran away with an easy win after starting slow. Not much to knock Oklahoma or Bob Stoops on here. Auburn: The Tigers played well in their biggest games of the season, but never came through. Losses to Clemson, Alabama, and Oklahoma all sting. This might not be a bad season, but it’s not one that fans on the Plains wanted and one that they will not tolerate again — especially if Auburn can’t win a big bowl game. Clemson: As much as last year’s loss stung for Clemson, this year’s win more than makes up for it. Clemson — led by an all-time great quarterback in Deshaun Watson — currently sits on top of the college football world. The Tigers put up over 500 yards on Alabama, and if not for two turnovers they may not have needed a final-second score to win the game. I don’t think that any player, including Johnny Manziel, has ever hurt Nick Saban or Alabama as much as Hunter Renfrow has. With all due respect to Watson, Renfrow absolutely deserved the game MVP award — not the least because of his touchdown-saving tackle on Gallman’s fumble. Alabama: The Tide almost managed to beat Clemson again, but beating the Tigers two years in a row just proved too much to ask. Alabama didn’t do much wrong. Clemson was just a better team and the offense eventually wore down Alabama’s defense, which made all the difference.